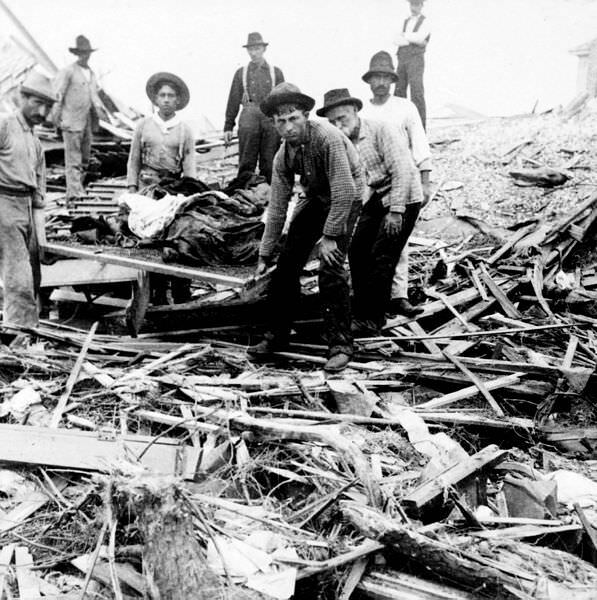 Carrying bodies from the wreckage of the 1900 hurricane in Galveston. The Texas hurricane of 1818 also caused considerable damage on Galveston Island. In 1818, Texas was part of the Spanish colony of New Spain (Mexico), which was then fighting for independence from the mother country. The Spaniards had settlements at San Antonio de Béxar, La Bahía del Espíritu Santo (present-day Goliad), and Nacogdoches. The total Hispanic population probably numbered less than 4,000. Texas was primarily inhabited by Native Americans. Stephen F. Austin and his American colonists did not arrive until 1821. In 1816, French privateer Louis-Michel Aury established a base on Galveston Island, a short distance from the Texas mainland. In April 1817, when Aury left to help Francisco Mina invade Mexico, pirate Jean Laffite took control of the establishment. He ran a privateering, smuggling and slave-laundering operation from the island. A visitor who arrived in January 1818 described Galveston as a “wild sand bar with four or five ‘temporary miserable hovels’ for the 50 men, mostly blacks and mulattoes, living there.” (1) Laffite inhabited a two-story frame house built on a slight elevation. In early 1818, Laffite and his men were temporarily joined by approximately 100 Bonapartists – mainly French supporters of Napoleon – on their way to found a colony called Champ d’Asile beside the Trinity River. A few months later, after learning that a Spanish force was coming to eject them, the French colonists returned to Galveston Island to wait for transportation to New Orleans. They arrived in July and settled near Laffite’s village. The Champ d’Asile refugees built a small protective earthwork on a three-foot rise about 400 yards from the water. They were still there when the hurricane struck in September. On September 10, 1818, a hurricane passed the Cayman Islands. It blew across the Yucatán Peninsula and then veered north towards Texas. The residents of Galveston Island saw the storm approaching on the evening of September 12, but did not anticipate a hurricane. The French refugees were preparing to go to bed when it struck. The raging winds, the rushing waves shook the earth: the rain fell in torrents, the sky was ablaze; the piles supporting our hut broke: the canvas covering it was torn, and I saw a black column, a whirlwind that carried ravage and destruction in its flanks. The sea flowed in from all sides, the wind lifting the waves. A vortex of wind tore off and removed the remnants of the sail that sheltered us. Night passed and faint light, whitening the horizon, announced that day was soon to appear. Complaints and cries could be heard from all sides when the wind ceased for a moment to roar, and then redoubled its fatal efforts. Day broke, the storm was not yet calm; but since we could see the danger, it was easier to avoid it. We were able to bring relief to those who were hurt and save them from death. We transported them to the strongest dwelling [Laffite’s], around which we had all gathered. The island of Galveston, invaded by the sea, seemed to be part of it. This scene of desolation became more terrible when we saw that the waves, redoubling to flee, broke the cables that held our boats and dragged them into the gulf; every means of salvation was taken from us; I dared not announce it, the words died on my lips, and my heart broke. However, the wind subsided, and the sea began to re-enter the gulf. By the time the storm was over, only six buildings remained on Galveston, one of them Laffite’s house. At least four of Laffite’s vessels were sunk or driven ashore. Wrecks from the storm were reportedly found five miles inland in the 1820s. Virtually all of the French refugees’ supplies were lost and the island’s wells were contaminated with salt water. The settlers were dependent on Laffite’s generosity for survival. Although there is no good estimate of the number of lives lost in the hurricane, many Karankawa Indians reportedly perished. It’s no wonder Narcisse Rigaud, who survived the 1818 Texas hurricane, tells General Humbert, “this island promises nothing but difficulties,” when he again finds himself stranded on Galveston in Napoleon in America. William C. Davis, The Pirates Laffite: The Treacherous World of the Corsairs of the Gulf (Orlando, 2005), p. 352. C. D., Le Champ d’Asile au Texas (Paris, 1820), pp. 103-105. W. Armstrong Price, North Beach Study for the City of Corpus Christi (Corpus Christi, TX, 1956), p. 67. “By the time the storm was over, only six buildings remained on Galveston. At least four of Laffite’s vessels were sunk or driven ashore. Wrecks from the storm were reportedly found five miles inland in the 1820s. Virtually all of the French refugees’ supplies were lost and the island’s wells were contaminated with salt water”. There were many deaths. So why did the 1818 survivors rebuild in an unsafe part of the country? Did they believe/hope that their rebuilt homes would be hurricane-proof next time or that the emergency shelters would be big enough for all the homeless next time? Few of the 1818 survivors actually stayed on the island, Hels. The Bonapartists were finally able to get to New Orleans, thanks to the assistance of Laffite and General Humbert. Laffite himself vacated Galveston in 1820, after being told to leave by the US Navy. Upon departure, he deliberately set fire to most of the settlement. But Galveston remained one of the best sites for a port on the Texas coast, which Stephen Austin and his colonists (who started arriving in 1821 and had no memory of the 1818 hurricane) desperately wanted. So in 1825 the Mexican Congress officially designated Galveston as a port of entry. Hurricane-proofing and emergency shelters did not enter into planning back then. Which Arsene are you referring to? The raging winds, the rushing waves shook the earth: the rain fell in torrents, the sky was ablaze; the piles supporting our hut broke: the canvas covering it was torn, and I saw a black column, a whirlwind that carried ravage and destruction in its flanks.